"I’m not what you’d call a “natural” at fundraising. I don’t like to sell things or send my kids out to sell things. So, it’s a bit ironic that I’ve been involved in planning fundraisers for everything from school capital campaigns to youth group mission trips for the past 10+ years. Chalk it up to being a mom of four kids. When we adopted two of them, our family fell in love with the organization that cared for them in Liberia, so we’ve been involved in nonprofit fundraising for the past eight years, too. Strangely enough, my distaste for overpriced products that serve no real purpose is what led me to the holy grail of all fundraising secrets. **Secret: Figure out what people really need and provide it to them in a way that saves them time or money or improves their relationships with others. I know. It’s Business 101. I didn’t say I was brilliant…just cheap. But here’s the thing. When volunteers get together to decide on a fundraiser for their cause, we often start with a list of products or ideas and decide on the one we dislike the least. Or sometimes, we decide on the one that promises us the highest return or the least investment of time. After all, we’re busy and our kids’ schools need money, for goodness sake. But there are only so many purchases a sane mom can make of elementary school art on oven mitts before she develops a twitch at the mention of fundraisers. You know what I mean? Somewhere on the path of purchasing frozen cheesecakes and popcorn at 1000% mark up, I began to think about the potential buyers and meeting their needs, rather than my own. Were they parents with small kids and needed time to Christmas shop alone? A babysitting night with teen volunteers at the beginning of December turned out to be a big hit, especially if we fed the kids. Were they busy with all adults in the household working full time? Delivering home-cooked meals they could order and pay for online was worth a mint. So, do I love planning fundraisers now? Hmm, I may not go that far. But I do love the causes that are behind them, and I do love finding ways to make people’s lives easier. When those match up in an ideal fundraiser…well, even this cheapskate will pay good money for it." 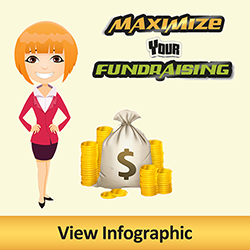 Whether you are coordinating your first fundraiser, or are a seasoned fundraising pro, we have some helpful resources to make your next event a major success! Check out our Fundraising Resource Page! You can definitely use SignUpGenius for ordering team apparel. Users can select their size, and even pay for their items on the sign up. Someone from our support team will be happy to help you set this kind of sign up. Click on the help option on the site and send an email with any specific questions you have and we will be happy to help! This is an inspiring story. Thanks for sharing! I am taking over the Fundraising PTA position and this article was an eye-opener. Thank you! Can I use sign up genius for ordering apparel from our team? with teen volunteers at the beginning of December turned out to be a big hit, especially if we fed the kids. Were they busy with all adults in the household working full time? Delivering home-cooked meals they could order and pay for online was worth a mint.